Sorry for the lack of updates here recently, but between Thursday playing and directing, Friday family stuff, and yesterday finishing an article for American Chess Magazine I wasn’t able to keep up as well as I would have liked to. Round five saw Aman paired against Armenian GM Gabriel Sargissian. Aman needed a win to realistically keep his hopes alive, but unfortunately the noted endgame player Sargissian ground him down in a more or less equal ending. In round six Aman had Black vs. English IM David Eggleston. Aman played his third different response to 1.e4 in this tournament, this time essaying the Sicilian Kan.
Once he secured a passed c pawn that was running to daylight Eggleston resigned. Round Eight once again had Hambo paired against a tough GM, this time the Peruvian legend Julio Granda-Zuniga. Long time readers of mine will know that I often cover Julio’s games since he was the first GM I ever met, way back in 1992 in my hometown in Midland, TX when he played in a small local event of ours since he was in town seeing a family friend. After a maneuvering game in the Old Indian Aman unfortunately stepped in to a tactical shot and was soon put away by the Peruvian. Right now Aman is playing his final round game against American IM Kostya Kavutskiy, which I will post later once the games are published. Today in Round Five of the Isle of Man chess tournament Aman managed to win a nice grinding game. 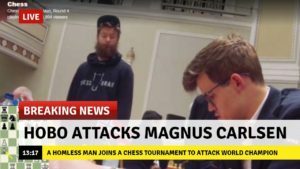 The above photo was shared on the chessbrahTV Twitter account, so it would appear to be one of the lads poking fun at Hambo. It also happens to be hilarious! Aman quickly gained a protected passed pawn, but it didn’t seem likely that he would ever be able to get it moved. A clinic on maneuvering then ensued as the pieces were shuffled until Hambleton was able to sac on e5 on his 98th move! From that point on it was a fairly one sided affair. Tomorrow Aman is matched up against Armenian Gabriel Sargissian, who suffered a defeat at the hands of Hikaru Nakamura today and will likely be out for a little revenge. This will be a good test for Aman who needs pairings like that for the rest of the tournament. In playing through this game earlier, one thing that struck me the most is that so many casual fans seem to complain that chess is nothing but draws. On pretty much any active chess forum you’ll see posts decrying that “draw death” is upon us. If you dig in to those threads you’ll see a pattern emerge where there are always a handful (typically a rather small handful) of folks who try to explain that not all draws are created equal. There is quite a difference between the peaceful handshake on move 15 while still in theory because no one felt like taking any risks and a fighting draw that is played out until there is nothing left to attempt. This game certainly qualifies as the latter. Early on Aman sacks an exchange on his fourteenth move for full comp in the form of shattering White’s structure while gaining a beautiful outpost on f5 for his knight. Then on move 30 White returns the exchange to fix his structural deficiencies and going up a pawn. However, there are bishops of opposite color, and once the heavies are off the board Aman is easily able to hold the draw in spite of losing a second pawn. While there is no actual way to tell what score would be needed for a norm in any kind of open event such as this, it’s a good bet that the fewest amount of points Aman would need in his final five games would be 4.5, which would leave him on a score of 6.5/9. Assuming his pairings get progressively stronger as he wins that still gives him a shot. Of course the pairings may not work out and so he could score the 4.5 and it might not be enough. Time will tell. Let’s hope that great form takes hold and we all get to find out. Tomorrow Hambo faces untitled Indian player V. Pranav with the White bits. Victory at the Isle of Aman! Today in the third round at the chess.com Isle of Man Masters Hambo managed to get into the victory column with a nice win over legendary American author IM John Watson. Playing in a style that would make Lev Aronian proud Aman got something going on the kingside with h4-h5 and soon Watson gave up his queen for a rook, bishop, and two pawns. However, the tender squares around his king soon saw Watson forced to give up a rook so he resigned. Tomorrow Aman is matched up against Indian IM Eesha Karavade, about whom I know nothing. Author wainscottPosted on September 25, 2017 Categories Chess JournalismLeave a comment on Victory at the Isle of Aman! Today in round two Aman had the tough pairing against Super GM Arkadij Naiditsch. It looked like Aman would hold in a queen and pawn ending until he allowed Naiditsch to advance his deadly passed h pawn to h7 by playing 83…b4 instead of continuing the series of checks. This gives Aman .5 out of two to start. While that doesn’t technically put a norm out of reach, it does mean that he’s got his work cut out for him. Yesterday Canadian IM and noted ChessBrah Aman Hambleton began the hunt for what would be his final GM norm. I will be posting all of his games here for anyone who is interested in following his chances. Thursday I played a rated training game against NM Rithwik Mathur. I had agreed to play the White side of a line that he was wanting to test. I found a few moves I was particularly proud of, especially 20.c4 and I also made things harder than they needed to be (sacking the exchange back instead of finding 40.R3e4) but overall I felt like the game was fairly well played on my part. I do think that Rithwik missed two winning ideas. One was 52…a2 which I saw at the board, and the other was 53…Rg2 which was pointed out by NM Bill Williams after the game. Either way, I think that this game represents the first game in what will hopefully be a turnaround for me. Is This The Chess World Cup or Game of Thrones? This was the question posed by chess.com user franknstein earlier today, and I have to say it’s a good question. Granted, with a knockout format it’s practically a certainty that big names will fall to not as big names, but usually those things happen a bit here and a bit there. In round two we saw players such as Wojtaszek, Harikrisha, Anand, and Karjakin fall. Then today in the second day of the third round three more legends were eliminated as Nakamura, Kramnik, and Carlsen were put away. It was like watching the Red Wedding all over again. Tomorrow there are more elite players who will have to emerge victorious in their tiebreaks to avoid the same fate. Included in that group are MVL, Grischuk, Aronian, Caruana, Ding, and Giri. Speaking of Giri, he seemed to have the Three Eyed Raven protecting him today as he was dead lost against Sethuraman. However, the Indian used so much time seeking to land the killing blow that he wound up mired so deeply in time pressure that Giri was able to complicate things long enough and then finally escape with a draw. So today Giri is most likely wearing his nickname of Draw Master with pride. Here is the game. Stay tuned for the tiebreak’s tomorrow where there are certain to be more heads rolling. Also, big shout out to the Chess Brahs for providing their free streaming coverage each day. You can watch Yasser Seirawan and Aman Hambleton provide insightful commentary and analysis for the entire broadcast each day, usually with Eric Hansen lurking around somewhere and providing social media commentary. Watch them here. In fact, you should watch them any time they are streaming. Not only will you learn something, you’ll be entertained as well. Author wainscottPosted on September 10, 2017 Categories Chess JournalismLeave a comment on Is This The Chess World Cup or Game of Thrones? I was looking at the game Petrosian – Olafsson from the first round of the Candidates Tournament in 1959. My first instinct was to put the knight on d2. After all, who wants to put a piece on the bank rank intentionally when they don’t have to. Superficially it looks like the e4 pawn is being pressured, but there’s nothing to that in truth since White can’t bring enough pressure for that to mean anything. So then I asked myself what future does the knight have on d2 and what future would it have on e1? On e1 the knight can easily go to c2-e3 and play a role. On d2…not much. What makes the position so interesting to me is understanding that even just a month or two ago if I had this position in a game I would have instantly put the knight on d2. I’m hopeful that this is a sign that my positional play is in fact improving in the manner I’d like it to. For anyone who hasn’t heard, yesterday in Tbilisi Canadian GM Anton Kovalyov quit the World Cup in protest. So what happened? Well, ostensibly GM Kovalyov showed up at the playing hall and an arbiter informed him that he would not be allowed to wear shorts as it was against the dress code. There are two main problems that I have with this. The first is that Anton says that he checked at the last World Cup to make sure that shorts were OK and was told that they are. The second is that he wore the same shorts to the first two rounds and there were no issues at that time. And it’s not like he flew unnoticed under the radar here…this is the guy who took out five time World Champion Vishy Anand in round two. I say “ostensibly the issue” since the real issue appears to run much deeper. I’ll let Anton tell that story in the statement which he released a few hours after the incident. The issue were not the shorts but how I was treated. I came to the game and was approached by the arbiter asking me to change (first time). I told him that I don’t have pants with me, and then I noticed that I was playing black instead of white, which came as a surprise for me and asked him to check that. He and the other arbiters checked and confirmed to me that I’m …playing with black, we talked a little and everything was fine. Then came Zurab, he was very agressive, yelling at me and using the racial slur “gypsy” to insult me, apart from mentioning several times that I will be punished by FIDE. I told him that I had asked before at the previous world cup if what I was wearing was OK and I was told by somebody from the organization that yes. Zurab, in a prepotent way, said he doesn’t care, he’s the organizer now. At this point I was really angry but tried not to do anything stupid, and asked him why he was so rude to me, and he said because I’m a gypsy. So imagine this, the round is about to start, I’m being bullied by the organizer of the tournament, being assured that I will be punished by FIDE, yelled at and racially insulted. What would you do in my situation? I think many people would have punched this person in the face or at least insulted him. I decided to leave. Worth pointing out, I didn’t take any pants with me because I gained some weight and they were to tight. If the organization of the tournament would have warned me sooner I would have taken a cab to the mall and bought pants, without any problems whatsoever, but instead I was treated like garbage. I was too stressed out by the way I was treated and the threats of being punished by FIDE no matter what I do, so I choose to leave before I do anything stupid. Another point worth pointing out, Zurab never asked me to go and change, the conversation consisted of threats, insults, and agressive behavior from Zurab. He was clearly provoking me. This paints a much darker picture than the initial speculation. Of course, when you are dealing with someone like Azmai in the chess world you shouldn’t be surprised at that. Here are two reactions regarding that angle. The first was WGM Tatev Abrahamyan’s reaction on Twitter. Later, when Azmai “clarified” that he wasn’t being racist by calling Anton a gypsy, but rather that he meant tramp as in “dressed like a tramp” Tatev had this to say. Another pundit who was rightfully critical of Azmai’s behavior is IM Greg Shahade, who sent this tweet linking to his blog post where he spared no criticism. First, I think that dress codes at top events make perfect sense. After all, we all talk/dream/hope for the day when chess attracts numerous big dollar sponsors. There’s a reason why athletes have dress codes for how they need to show up looking when they get to the venue. With so much money on the line the league insists on projecting a certain image so as not to chase off sponsors and potential sponsors. It may not make the most sense in the world to talk about having a dress code at your average weekender, but this is an official event which is part of the world championship cycle, so come on guys, let’s look the part. However, if you are going to have a dress code then it needs to be enforced evenly and consistently. It’s improper to allow a player to wear shorts in the first two rounds, then suddenly take issue on day seven of the event. If the decision is made that something needs to be said, then it should not be said at the beginning of a round (possibly with the exception of the beginning of the first day) but rather should be addressed after the offending player’s game has concluded. Also, I don’t think that any valid excuse can be given to not having said something to Kovalyov on either of his two rest days. Why not inform him then so that he can do something in a way that won’t interfere with his play at all? Although I have not met him personally, from everything I have heard about him he’s a stand up guy. I don’t think that he would find the request unreasonable if it were made in a sensible way. That brings us to Azmai. There’s nothing I can say that Greg didn’t say better in his blog post, but I would like to point out that a discussion I often take place in is the discussion of how to attract sponsors to chess. The sorts of ideas that always seem to be kicked around have to do with formats and time controls. Fine, but isn’t any discussion of time controls, etc. rendered moot automatically when an official like Azmai is involved? Again, as mentioned above, sports leagues require certain images to be projected so as to not drive off sponsors. Yet with chess the league is FIDE, and Azmai is a high ranking FIDE official. What self-respecting Fortune 500 level company is going to put themselves in a position to deal with a guy like that? So with all of this in mind, my conclusion here is that I stand with Anton. I think that he made the correct decision to not play after the way he was treated, and I hope others see it that was as well.